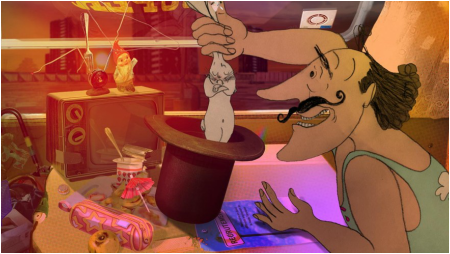 Borge Ring Award 2014 La Vie sans Truc - ANIS - we animate! "The Borge Ring Award this year goes to a silly, crazy, touching film that takes daunting pride in turning its back on classical mainstream animation principles. It does so in a charming and energetic manner which has us identifying with and feeling for its awkward antagonist. The story combines elements of realism, entertainment, poverty, politics, art, existential despair and, throughout it all, love. It then ties everything together in an unforgettable climax that will most likely raise some controversy... The Borge Ring Award goes to Anne-Laure Daffis' Life with No Tricks (La Vie sans Truc)."